Here is a picture of my grandfather, who was a detective sergeant with the London Metropolitan Police (Scotland Yard). 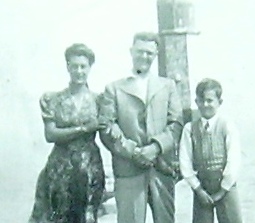 The other people in the picture are my grandmother and my father. I have a cabin up in Maine, which is where I spend my summers and as much of each winter as I can. It's where I get most of my thinking done. The rest of the year, I teach at a private high school down in New Jersey. I only teach one class a term, which gives me plenty of time for writing, but living in the chaos of central New Jersey is not conducive to the kind of thinking that allows me to map out a book. The Pekkala books, perhaps because they are part of the genre of detective thrillers, need to be planned almost completely even before the first word is written. When I first started writing under my real name, Paul Watkins, my approach was just to have a vague idea in my head and then to attack the blank page, hour after hour, and see what came of it. It was a very energetic way of writing. At the beginning of each day, I rarely knew where I was going to end up. I look back fondly on those times, with the same kind of affection as I look back on my first car, which was always falling apart and required an incredible amount of faith and tinkering to stay in motion. But that form of writing, passionate though it may have been, was very wasteful. I threw away almost as much as I wrote. Now I am more surgical in my approach. I remember a scientist explaining to me once that the great Apex Predators of the world - the Great White, the Grizzly, the Orca - expend a minimum of effort catching their prey, but that when they do strike, they do so with such incredible ferocity that the first attack is nearly always fatal. Now I try to write the way a Great White hunts. Which means I spend a lot of time swimming around in my head, making sure I have everything right before my fingers even touch the keyboard. Some of my friends down here in Jersey ask how I can handle the solitude of living up in the mountains of north western Maine. This thing is, it doesn't feel lonely or solitary, even though there are very few people around and the only ones I see regularly aside from my family are the guy at the gas station or the bear hunters who have camps up the road. When I am plotting out a book, I spend so much time with the characters that it actually starts to feel crowded. I wasn't able to write much on the blog this summer because the place where I live has no regular internet connection. On the one hand, I am glad not to have the distraction. On the other hand, I feel bad about the time gap in this blog. This blogging does not come naturally to me. One of the reasons I started writing was so that I could keep the world at arm's length, as that I could live between the cracks of the world. That freedom to make my own hours and work at my own pace and go where I want when I want is the great wealth of any writer, I believe. Writing under a pseudonym only increases that distance, which i found very disorienting at first but which I have learned to value greatly in the past few years. The Blog connects me to that world in a way not entirely comfortable to me. At least, right now. Maybe I will get used to it. In the meantime, I hope what I am writing is interesting. If you have any questions, you can contact me via the Inspectorpekkala.com website, and I would be happy to answer them on the blog. I receive a lot of messages through the site from all over the world and always reply to them as quickly as I can. I'll post a picture of the place where I live, and where I do my thinking. In my next post, I will write an update of the latest Pekkala book, which is due out early next year, and also the one I'm just finishing up now. I am pleased to report that the series continues to do well, and has now been translated into more than 20 languages, most recently Soviet Georgian and Macedonian.